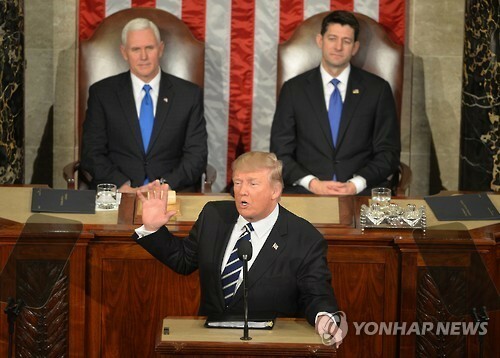 US President Donald Trump called North Korea "a world menace" and "a world problem" that must be dealt with "soon" on the eve of his first speech to a joint session of Congress, even though he made no mention of the problem during the address, a report said. Trump made the remark when he had dinner at the White House Monday evening with a group of 18 reporters from regional TV affiliates around the country, according to WCPO-TV, an ABC-affiliated television station in Cincinnati, Ohio. "North Korea is a world menace, it is a world problem," Trump said, adding that the country has to be dealt with and "has to be dealt with soon," according to the report. No further remarks on North Korea were available. The dinner with reporters was part of the White House efforts to reach the communities that voted for Trump. Tuesday's address to Congress was devoted mostly to domestic and economic issues. The only foreign threat Trump talked about in the speech was the militant group Islamic State. He vowed to "work with our allies, including our friends and allies in the Muslim world, to extinguish this vile enemy from our planet." The lack of any mention of North Korea was also against expectations because Trump has made a series of remarks in recent weeks about the threats the communist nation poses, especially since the North's latest missile launch on Feb. 12.